Custom plastic enclosures consisting of Two U-shaped pieces, snap together with tongue and groove. 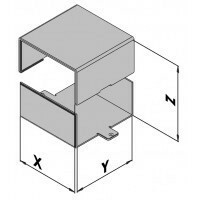 Custom plastic enclosure consisting of Two U; or C;-shaped pieces, rotated at 90°,snap together. The top enclosure is removable with a screwdriver.